Having a pet to play with, talk to, and touch can be a great benefit for young children, especially shy ones. Pets give unconditional love, and because they are non-judgmental pets can help a child who is lonely, shy, or emotionally distressed. Pets can make your children feel like they have someone they can “talk” to. They become a source of comfort and support. A positive relationship with a pet can help your child develop trusting relationships with others. A good relationship with a pet also helps children develop non-verbal communication, compassion and empathy. Research has shown that having pets can foster emotional, cognitive, social, and physical development in young children. There are many other benefits of having pets, including some that affect the health of young children. Studies have shown that interacting with animals can decrease the levels of cortisol (a stress-related hormone) and lower blood pressure. 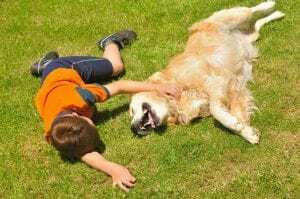 We already know that children with pets tend to go outside more often, so they have the added benefit of fresh air and exercise. When growing up in a home with pets, children often require fewer doctors’ visits and have a lower risk of developing common allergies and asthma. Children develop a sense of responsibility as they learn to feed and care for their pets. Taking care of a pet provides boys and girls with plenty of opportunity to develop their nurturing abilities, important in adulthood if choosing to become parents. Pets can help emergent readers feel comfortable reading out loud, thereby contributing to their self-confidence. Children with pets have shown improved impulse control, social skills, and self-esteem. As parents we must make sure that the experience of having a pet is a positive one by making sure the pets are cared for properly (treated gently and appropriately) and ensuring that our children are safe and healthy around our pets. Dinah Castro is a Bilingual Family Well-Being Educator with Cornell Cooperative Extension of Suffolk County’s Family Health and Wellness Program. She can be reached at 631-727-7850 ext. 351 or at dc258@cornell.edu.